The neighbourhood around the Benedictine St. Peter′s Abbey is the oldest quarter of Salzburg. The main entrance of the abbey faces the southern side-entrance to the Franziskanerkirche. St. Peter is the oldest monastery in the German-speaking world; some say the oldest continuously active monastery North of the Alps. In any case, St. Peter was formally re-vived by St. Rupert in 696. Rupert needed a base for his mission work; he probably used an existing community of monks, the foundation of this community might go back to the age of St. Severin in the 5th century. This is indicated by written documents and walls from that time. Until 987, the abbot of St. Peter was at the same time bishop of Salzburg. Only then the office was divided into two, even though St. Peter remained the residence of the bishop until 1110. During the middle ages, a competition between monastery and diocese grew. St. Peter became famous for its scriptorium and underwent the Melk reforms in the 15th century (a major modernisation named after the "leading" monastery in Lower Austria). In 1622, Prince Archbishop Paris Lodron founded the University of Salzburg at the site of the old university campus; it was a Benedictine university under the rule of St. Peter. It was controlled by St. Peter until the secularisation and subsequent downgrading of the university into a college in 1810. The re-foundation as a full university was also closely linked to St. Peter, since it was Abbot Karl Klotz who laid the foundation for the effort in 1926. In the following year, St. Peter was elevated to the rank of an archmonastery ("Erzabtei"). The Nazis expelled the Benedictine monks and confiscated their properties, but did not dissolve the monastery as such. The monks returned immediately after the war. St. Peter is a major landowner in Salzburg and surroundings; its properties contribute to charitable, spiritual and cultural work of the approximately 20 monks. In 2010, Archabbot Bruno Becker resigned after admitting the sexual abuse of a boy some 40 years earlier. The incident was uncovered during a wave of similar cases getting reported all over Europe and caused much debate in Salzburg, where St. Peter and its abbot have a very high standing. The church of St. Peter′s Abbey is high-Romanesque and dates back to the time of the monastery's foundation. However, it was decorated with Baroque elements in the early 17th century under Abbot Beda Seeauer. 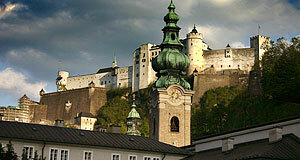 It is one of the many buildings in Salzburg that contains elements from Romanesque to Rococo Style. The first church on this site was probably built shortly after the death of St. Rupert, but only the ground floor of the Western tower remains from this building. After the fire of 1127, the current basilica was built under Abbot Balderich around 1130. The main nave of the church contains the Rupert Altar with the so-called "Felsengrab" ("rock tomb") which was the original tomb of St. Rupert. Some bones of the saint are kept in a shrine in the altar of the middle nave, but most of Rupert′s relics are kept in a shrine under the main altar of the cathedral. In the right nave of the church you find a second tomb of a saint, St. Vitalis, in the red marble of Adnet. The main altar is of marble, too, and decorated with a painting by Martin Johann Schmidt. The stucco decorations were made by Benedikt Zöpf, the Rococo grid from 1768 by Philip Hinterseer and the frescos and several paintings by Franz Xaver König. In the surrounding chapels you see a number of modern frescos by Anton Faistauer. St. Peter is home to the oldest library of Austria; a particular gem is the 8th century Verbrüderungsbuch book. The library was modernised in Rococo style in 1768; it is not open to the general public and can be seen with special guided tours on rare occasions only. It contains some 100,000 volumes. Furthermore, there are collections of annotations and musical instruments, important archives and other collections in the posession of the monastery. Tourists will rather notice the famous cemetery and the ancient Peterskeller restaurant, the latter one dating back to 803.